Complete videos of protest and arrest by Demeeko Williams at end of story. Police cart off protester outside Homrich gates. Photo by Mark Tucker. DETROIT – Members of the Detroit Water Warriors, the Detroit Water Brigade, Call ’em Out and others today put their bodies on the line to stop Homrich Wrecking trucks from shutting water off to the people of Detroit, the poorest major city in the U.S.
At least 10 of many protesters blocking the gates to the facility at 2660 E. Grand Blvd, including religious and community leaders, were arrested and brutally treated by police, said Demeeko Williams of the Water Brigade. 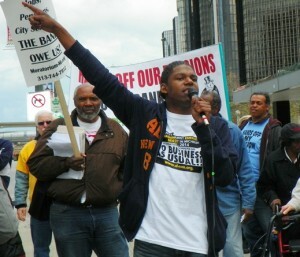 Demeeko Williams during May Day protest against bankruptcy. 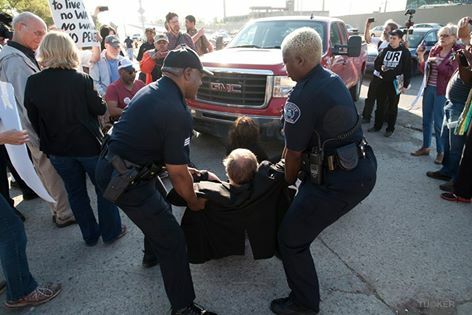 Others arrested included Pastor Bill Wylie-Kellerman and his wife Denise Gruebler, Father Tom Lumpkin, Sister Mary Ellen Howard, Detroit School Board member Elena Herrada, and Pat Driscoll, an activist with Detroit Eviction Defense. 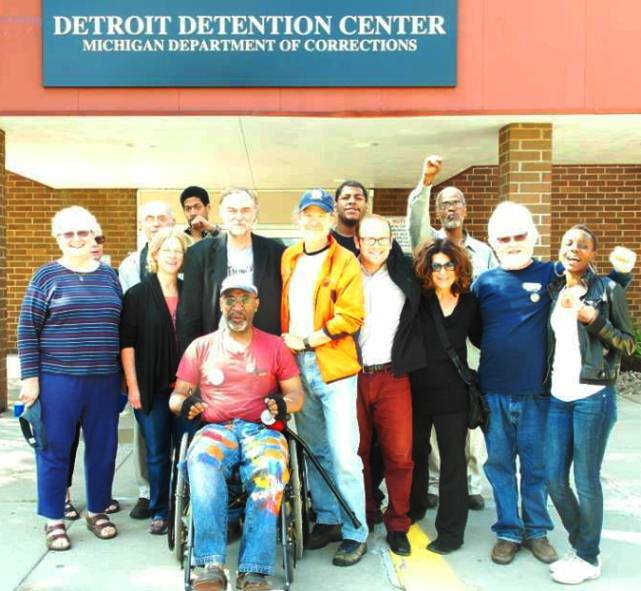 Herrada said they were charged with “disturbing the peace” and face a court hearing July 21 at 8:30 a.m. in Detroit’s 36th District Court. “We will not stop until they stop,” Herrada told VOD. Howard said police threatened to jail them until their July 21 hearing if they didn’t stop singing, “Wade in the Water,” but that in the end they posted bond and were released. 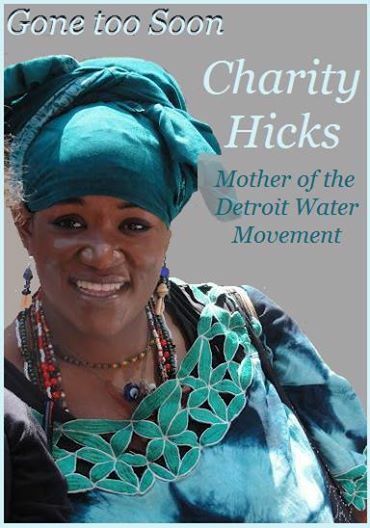 Williams also announced that Charity Hicks, the first to take action protesting water shut-offs in her neighborhood in May, passed away July 9 after being in a coma since May 31 in a hospital in New York City. Hicks was policy director for the East Michigan Environmental Action Council (EMEAC). 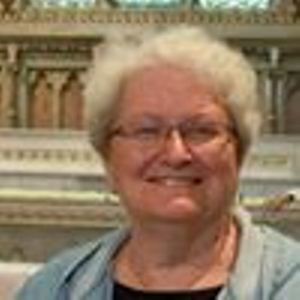 She was the victim in NYC of a hit and run driver as she attended a national conference in the city. Those included being kept in a holding tank with one toilet housing hundreds of women. The Detroit Water Board approved a $5.6 million “Water Shut-Off/Turn-On Project” contract with Homrich Wrecking, headquartered in Carleton, Michigan, April 24. The contract is costing more than delinquent bills, according to some sources. Despite the city’s announcement, after protesters’ repeated demands, that it will begin shutting off delinquent corporations, it has not stopped shut-offs in the poorest neighborhoods of the city. At least 12,000 Detroiters have been shut off, including elderly citizens, families with children, and disabled people. 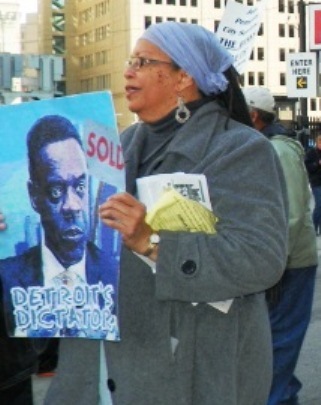 Protester at bankruptcy court April 1, 2014 carries depiction of “Dictator” Kevyn Orr. The shut-offs, ordered by Emergency Manager Kevyn Orr, are taking place during ongoing bankruptcy negotiations in New York City with Detroit Water and Sewerage Department lenders. The water shut-offs have engendered publicity across the world. In many countries like Great Britain, water shut-offs, even by private entities like Thames Water, are illegal since they are considered a threat to public health and safety. 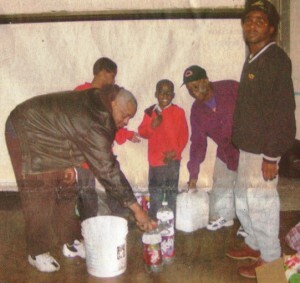 When Mayor Kwame Kilpatrick, under pressure from suburban interests, ordered mass water shut-offs in 2002, media came from as far as Britain and Australia to film the events. After a long delay, the Detroit City Council finally passed a “Water Affordability Plan” that was originally supposed to gear rates toward customers’ incomes. It was substantially altered, then administered by the city’s Human Services Department, which was wholly shut down last year by Mayor Dave Bing, despite being nearly 100 percent federally funded. In the interim, DWSD has raised Detroiters’ sewage rates much higher than those of suburban communities, allegedly to compensate for delinquent water bills in the city. The city also attaches unpaid water bills to residents’ property tax bills, subjecting them to possible tax foreclosure and actual loss of their homes along with their water. The State Department of Human Services, through its Child Protective Services workers, frequently removes children from homes affected by utility shut-offs instead of providing assistance. 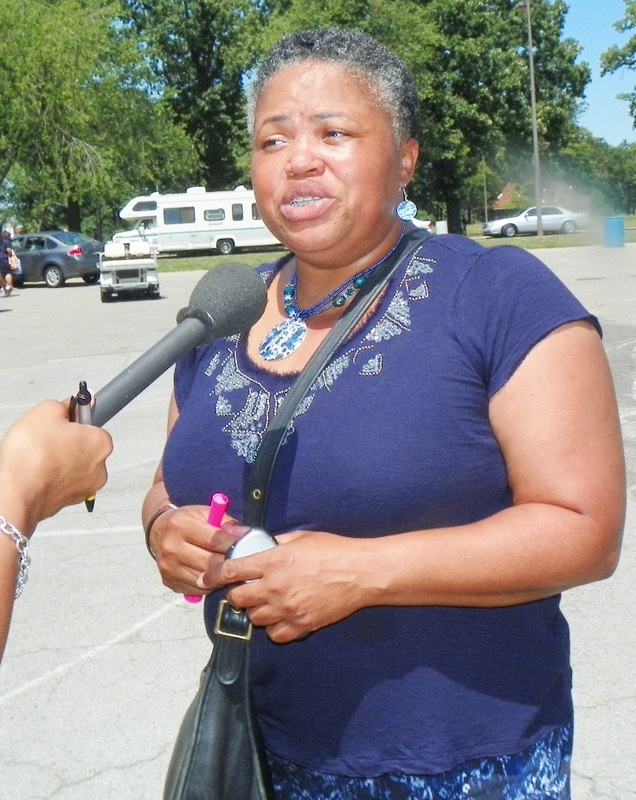 Demeeko Williams said groups are spreading out through the city’s neighborhoods under the leadership of well-known activist Monica Patrick and others. He said residents can call 1-844-42WATER and volunteers will be dispatched to their homes and those of their neighbors. 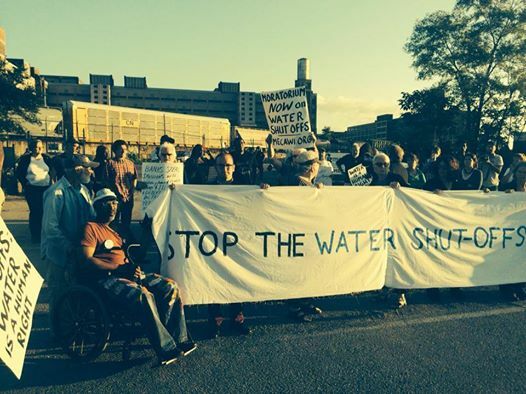 The Detroit Water Brigade’s website is at http://detroitwaterbrigade.org. Leaders of the brigade can be reached by calling 313-279-0608. We demand that the Detroit Water and Sewerage Department stop violating basic human rights and return clean water to Detroit citizens. 3,600 residents in Detroit are already without water. Why? Because they have bills of $150 or more, or are 60 days past due on bills in a city that is bankrupt. Soon, half of the Detroit Water and Sewerage Department’s 323,900 local residents will be out of water. It is unacceptable to withhold our citizens’ basic needs like clean running water. We need to call attention to this unacceptable violation of human rights, and quickly — before more homes run dry. 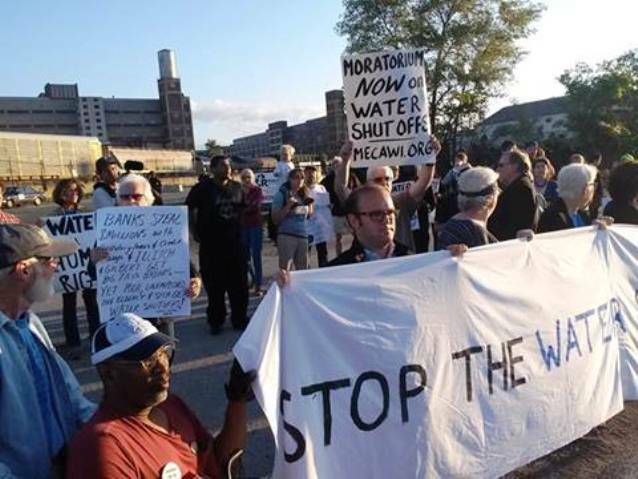 Sign our petition to demand that the Detroit Water and Sewage Department restore running water to the residents of Detroit. This petition was created on MoveOn’s online petition site, where anyone can start their own online petitions. Working Families didn’t pay us to send this email—we never rent or sell the MoveOn.org list. Demeeko: Dude the police was very out of order. They put my friend Baxter Jones under panic attack when he was assaulted by being pulled out of his chair.. a few reports have claimed that they seen Baxter out of his chair. Anybody who messes with the disabled is heartless. Baxter Jones (left) as crowd masses in front of Homrich gates July 10, 2014. Rich people hire someone to represent them. Poor people need volunteers to represent them. These are real American heroes trying to do the right thing. Detroit water has been in de facto (and de jure, via judge Feikins) takeover for most of the last 50 years. The etymology of the word LAW (1066), means to lie. The truth will set you free, but a judge, cop, and a lawyer will lock you up.